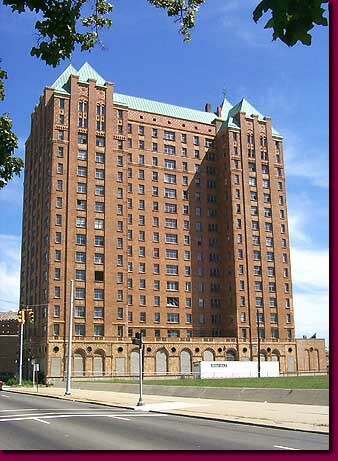 The elegant and richly appointed Lee Plaza on West Grand Boulevard awaits the wrecking ball. Grande Grand Detroit. The word grand[e] appears prominently in Detroit. Perhaps it lingers from our French days and in name city. Perhaps it is a remnant of eras flush with confidence. The northern end of the downtown is capped by Grand Circus park, a two block half moon park. One of our great radial avenues is Grand River, an old native American trail that extends to Lansing. About four mile from its origin it intersects with Grand Boulevard, a great broad avenue that U wraps around old Detroit from the Belle Isle Bridge to the Ambassador Bridge. The irony occurs, of course, when something once elevated to grandness descends into ignominy. With this as a cue, let's visit the area where Grand River Avenue flows across Grand Boulevard.